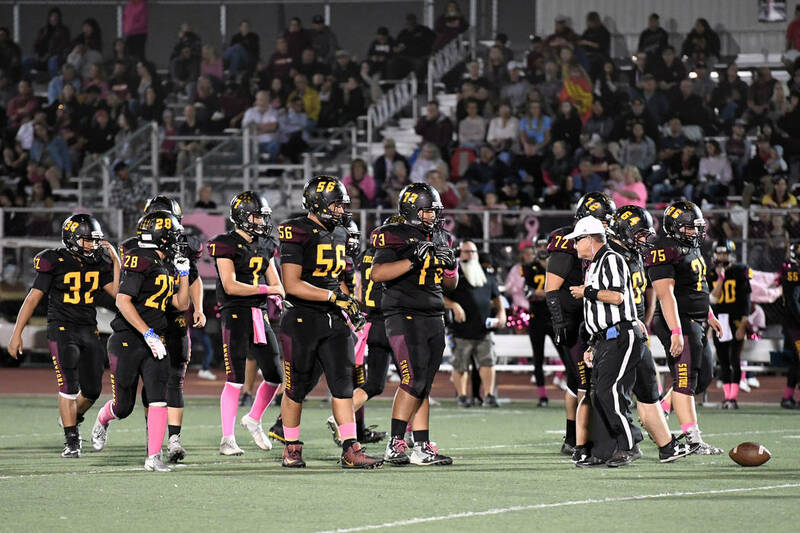 When the Pahrump Valley High School football team takes the field tonight for its first home playoff game in years, fans easily will notice Nico Velazquez barreling through a hole and dragging defenders along for the ride. They will see Casey Flennory slice through a hole and race into the open field. Joe Clayton/Special to the Pahrump Valley Times Pahrump Valley High School linemen Brandon Bunker, Armani McGhee, Jakob Landis, Caleb Sproul and Zach Trieb after practice Oct. 30 at Trojan Field. 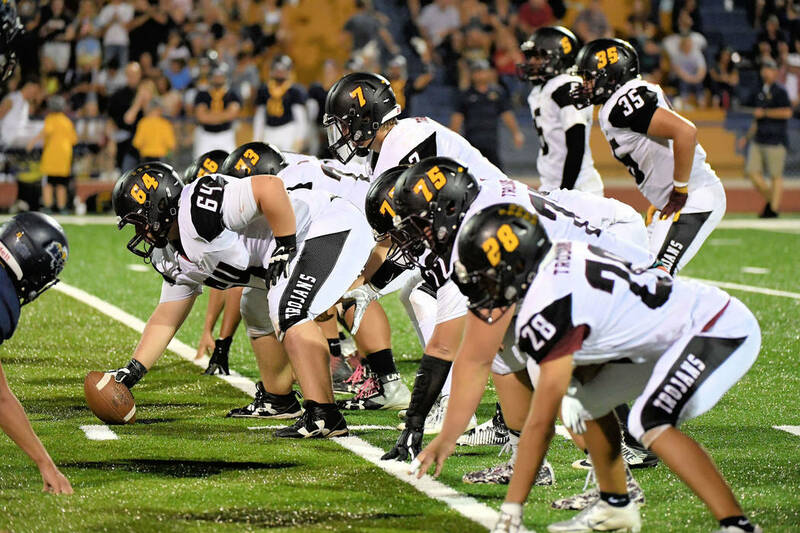 Peter Davis/Special to the Pahrump Valley Times Offensive linemen Brandon Bunker (56), Armani McGhee (73), Caleb Sproul (72), Jakob Landis (64) and Zach Trieb (75) lead the Pahrump Valley High School football team to the line of scrimmage during a 66-0 win over Western on Oct. 12 at Trojan Field. Peter Davis/Special to the Pahrump Valley Times Pahrump Valley High School senior center Jakob Landis prepares to snap the ball to sophomore quarterback Dylan Wright during the Trojans' 66-0 win over Western on Oct. 12 in Pahrump. Peter Davis/Special to the Pahrump Valley Times From left, Brandon Bunker, Armani McGhee, Jakob Landis, Caleb Sproul, Zach Trieb and Dylan Grossell on the line of scrimmage against Boulder City during Pahrump Valley's 32-28 loss to the Eagles. Also pictured are quarterback Dylan Wright (7) and running backs Casey Flennory (5) and Nico Velazquez (35). Horace Langford Jr./Pahrump Valley Times Pahrump Valley High School linemen Armani McGhee, Brandon Bunker, Jakob Landis and Caleb Sproul after practice Oct. 30 outside the school. But what’s harder to see is the mass of bodies up front. It’s understandable, in a way, big bodies blocking the view of other big bodies blocking the big bodies on the other side of the ball can make it hard to tell what’s going and who’s doing what. 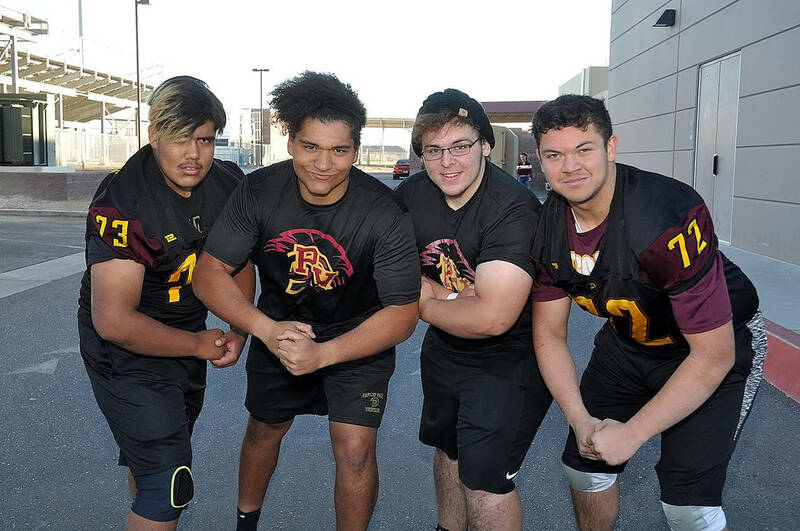 During the week off the Trojans earned from finishing first in the Sunset League, six of the seven linemen sat down in a corner of the school’s weight room to explain just what they do, how they do it, and why they do it so well. They are four seniors, a junior and two sophomores. 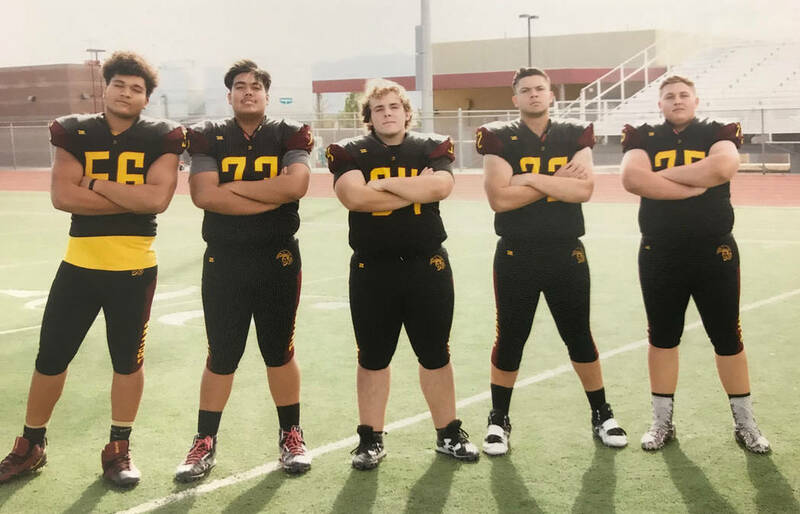 They range from 5 feet, 9 inches in height up to 6-foot-4, from 195 pounds up to 303, according to the Pahrump Valley roster on MaxPreps.com. That is most evident on the line, where, despite their obvious differences, the players often think alike when it comes to how they function on the field and what makes them so good. “Since we practice together, like Bunker said, we practice fundamentals every day, and just being around each other we know what we do so we can work around that,” added senior Zach Trieb, who packs 303 pounds on his 6-foot-1 frame and looks every bit like the proverbial immovable object. The familiarity certainly helps, but the chemistry seems natural. “We all hang out, have a good time, then go back to the grind,” agreed Caleb Sproul, a 6-foot-3, 270-pound senior. “We all hang out together, we’re all friends, we all see each other around school,” added Trieb. They will tell you that specific strengths make it easier to work as a unit. “I think it’s our timing, the way we work together,” said sophomore Jacob Lopez, who stands 5-9 and weighs in at 198 pounds. “It’s our footwork that makes us good,” said 6-foot-2, 287-pound Armani McGhee, the lone junior. If footwork is not the first thing you think of when pondering the skills of a group that includes several people pushing 300 pounds — at least one from the other side — well, that’s why what they do needs to be explained. It does start with strength, as physical force is required to open holes for running backs and provide time for quarterbacks. And holes do get opened: The Trojans have rushed for 2,280 yards this season, or 6.2 per carry. That includes an almost ridiculous 445 yards rushing in an opening loss to Lowry. “Their size obviously helps, but not only that they’re really strong in the weight room,” Clayton said. “They’re really a big, strong group. They get a pretty good push off the line with their size and strength. But while brute strength comes in handy, more is required for the entire unit to function effectively. That quality helps them improve when they study game film and put what they learn in place on the practice field. “We’re just looking at things we can improve on, are we stepping the right way, how fast we’re getting off the ball, things like that,” Bunker said. “I watch my first step and my hand positioning,” offered Lopez. “When I’m looking at film, like he said, the first step, getting off the ball quickly and just getting your body in the right place to make the good block,” added Trieb. One other area of agreement: Five of them had the same answer as to who they would least like to face as a defensive player. “He’s an absolute animal on the field,” Pearson added. McGhee’s presence is so commanding that taking his place for a key game against Cheyenne focused a great deal of attention on Lopez. McGhee sat quietly smiling hearing how none of his teammates wanted any part of him as an opponent. For his part, he pointed to Trieb. Landis, who was out sick that day, agreed with McGhee after the next afternoon’s practice. “Trieb’s big and strong and he gets in front of you really well,” he said. A recurring theme of the season for the Trojans has been strength in the second half. They just don’t seem to wear down. “I don’t even think about stamina. I’m just thinking play by play, just getting through, blocking my guy,” Bunker said. “From our conditioning and everything, stamina really isn’t a problem any more,” Trieb said. “During conditioning our coaches remind us about the fourth quarter,” added Sproul. McGhee said the lack of depth on the Trojans’ roster meant stamina was basically a necessity. “Knowing where we come from we have very few kids, so we kind of have to adapt to the situation of not having subs,” he said. During the second halves of games, Pahrump Valley has outscored its opponents 160-86. In league games the difference is even more dramatic: 98-26 with two shutouts. The best examples? At Democracy Prep, a 32-25 halftime lead became a 48-25 win, and at Del Sol, when a 7-7 tie evolved into a 27-14 victory. While the Trojans’ relentless ground game can have a demoralizing effect on opponents, the infrequent but effective passing game has stuck daggers into foes’ hearts at times. 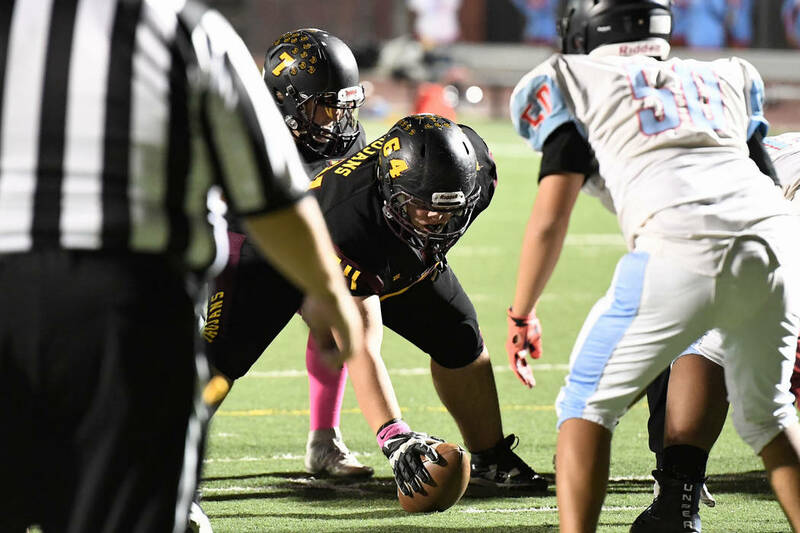 Pass blocking is a very different animal than run blocking, but the few times they are required to do it appears to be handled with ease by Pahrump Valley’s linemen. Because the Trojans don’t pass much, defenses often are caught by surprise. But, rarely, a pass is in order, and they will be looking for it, which can make the job tougher. “Most of the time, yes it does, but you’ve just got to do your job no matter what,” said Sproul, who according to Schmidt, has the best wheels of the group. “If the linebacker is rushing in, you have to keep an eye out for him so you have to observe what’s happening while you’re blocking, so if there’s another person rushing you have to try and get both of them,” Pearson explained. Linebackers also pose a potential issue for Landis. “I’m a lot heavier than they are, so trying to catch up is sometimes a problem,” he admitted. Pahrump Valley heads into tonight’s playoff game against Boulder City with a 6-3 overall record. The Trojans are guaranteed just their second winning season in a decade, and one home victory is all that stands between them and the Class 3A state semifinals. “During the summer we put in some hard work, and then going to SUU (football camp at Southern Utah University) and doing what we did at SUU was definitely an eye-opener,” Sproul said. The Sunset title has made this a special year, but to hear Clayton tell it, this might have been a special year regardless of the record.